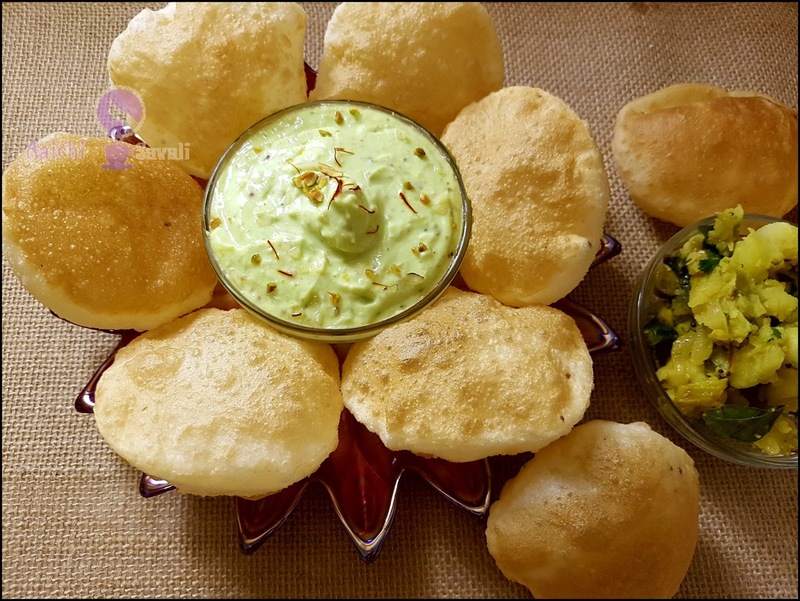 Gudi Padava near the corner and to celebrate this festival, I am sharing with you this semolina Poori(Rava Poori) recipe. In Maharashtrian families, there is tradition to make this Shrikhand, Poori and Batatyachi Bhaji (Potato stir fry) or Puran Poli to celebrate this gudi padawa festival. Gudi Padava signifies the arrival of spring and to the reaping of Rabi crops. (Gudi means flag, erect flag on the houses as part of the celebration in Maharashtra where its mainly celebrated. The word padava is derived from the Sanskrit word pratipada for the first day of each fortnight in a lunar month, i.e., the first day on which the moon appears after the so-called "new moon" day (अमावस्या) and the first day after the full moon. A Gudhi is also hoisted on this occasion giving this festival its name). 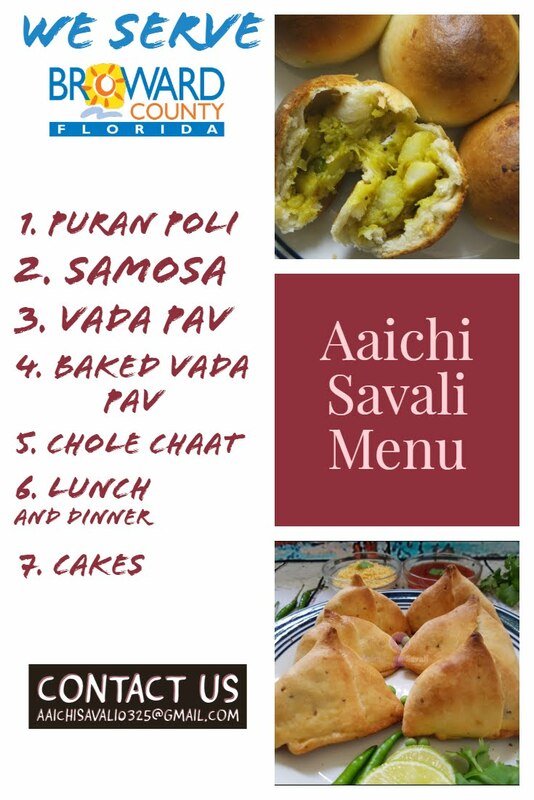 Semolina Poori is a quick recipe, a favorite lunch box menu for all the kids. As suji is readily available in all kitchens an easy recipe to try. It tastes awesome when served with shrikhand or potato curry. Puffed up poori it will stay puffed up even if it becomes cold after some time. Semolina gives this poori crispy and puffy texture. So let's start! In a mixing bowl add semolina or sooji, all-purpose flour, salt, and carom seeds, mix all well and by adding water knead to make dough for making puris. Cover and keep the dough aside for about 15 minutes to set. Now, roll out big chapati and with the help of cutter or small bowl (वाटी) cut puris from big chapati or you can divide dough into equal portions and roll out puris big or small as desired. Meanwhile, turn on flame, place kadhai and add oil for frying the puris, once oil is sufficiently hot, gently slide Puri in oil for frying. Press down the Poori very gently to make it fluffy. Flip the Poori and fry, until it gets golden brown color from both the sides. Place the fried poori over a plate covered with kitchen towel. Similarly fry rest of the pooris as well. Tadaa, scrumptious, yummy pooris are ready to serve. Serve hot with shrikhand, aloo curry(बटाट्याची भाजी), pickle or any other curry. Enjoy!!! Poori dough should be a little hard and rolled poori dough shouldn’t be too thin; it should be slightly thick. The oil used for frying pooris must be hot enough. If you don't want to add all-purpose flour, you can avoid it and add 1 cup semolina or wheat flour. 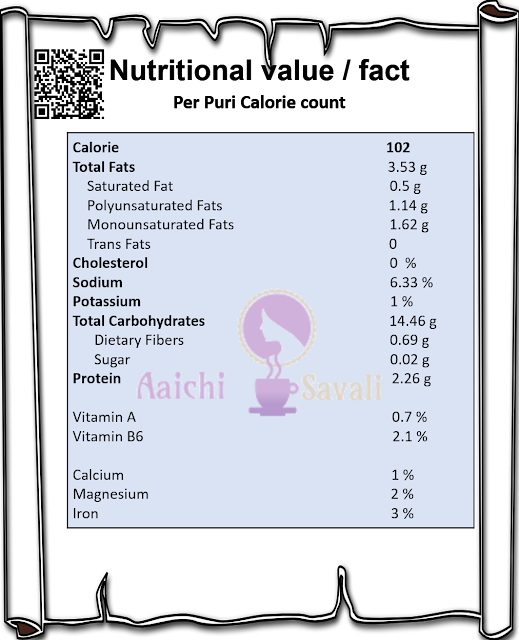 Per serving of Semolina Poori contains 102 calories, along with carbohydrates - 14.46 g, fats - 3.53 g, proteins - 2.26 g.
It's good to eat poori for breakfast or for lunch.